This is a great way to "sneak" healthy organ meats into your diet. Makes great hamburgers enriched with the nutrient dense organs like liver and heart. We have been eating this ground beef with organs for years and love it. No one in my family likes organ meat so I have to sneak it in and this is the best way. 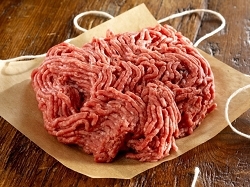 If you are used to plain ground beef this will taste a little "gamier" but it is very mild (compared to other farms). It can easily be hidden in chili, taco meat, pasta sauce or anything with extra spices/sauces....however we eat is plain as hamburgers too. Organ meat is very beneficial but not so tasty so this is a great way to add it in your family's diet! I'm not a fan of all the organ meat I've tasted before. I guess I'm not a huge meat eater yet. That said, I use this when making hamburgers and find that it adds a wonderful complexity of flavor. I also mix it with regular ground beef often when making ground beef dishes without really noticing it. I agree that it is a great way to "sneak" organ meat into our diet.